The habitated moons and planets in the Cnuddly- System are faced with ruin. The surfaces of this varied and manifold worlds will be turned to wastelands. All life will be terminated. A huge galactical asteroid storm crosses the way of this solar system. At least to rescue a part of this phantastic fauna, a resolution was passed by the galactical government. Courageous pilots will cross the asteroid masses and hurry from planet to planet to save the few suviving creatures. You are one of these brave pilots. While you approaching a planet or a moon you navigate your spaceship through an asteroid field. If you've mastered this, your ship descends into the atmosphere of the target planet. There, a new mission waits for you. In the atmosphere the rescue module disconnects from the mothership. You can control the module and try to rescue the poor little creatures on the surface. Navigate the module exactly above one of those little individuals. Below a given flight hight a rescue beam-ray will be activated once the module stands still. If the creature toddles into the beam-ray, it will be beamed to the module. Please don't move the module before the creature has reached it. If you move, the beam-ray will be terminated and the creature continues its way not to the module, but to heaven! When the creature is on board the module, it has to be brought to the spaceship because the module can only hold one creature. Unfortunately the surface is bombed by downfalling meteors and collisions have to be avoided. 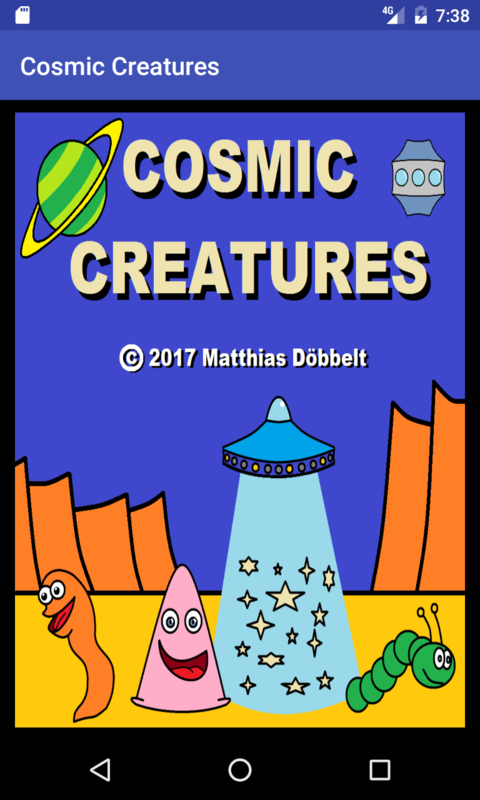 Cosmic Creatures is a cnuddly arcade game with varied colorful graphics. Spaceship and rescue module can be controlled simply by tapping the destination on the display where the vehicle has to be moved. This game is freeware. No in-app-products and no in-game-advertises. Only after the highscore list, advertises are shown. This is the only way this app will be funded. All games on this Page can be played on smartphones and tablets. Here is a video from Cosmic Creatures played on a tablet. Have a lot of fun saving the cute little cosmic creatures!